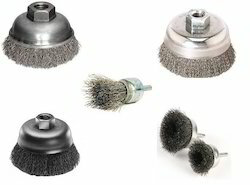 All type of crimped cup brushes available. Being a leading firm in this industry, we are deeply engaged in offering a high-quality range of Crimped Wire Cup Brush. 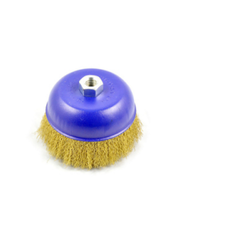 Mitsui Cup Brush 3" / 4"
Our product range includes a wide range of Crimped Wire Wheel Brushes such as Wide Crimped Wire Wheel Brushes and Thin Crimped Wire Wheel Brushes. We provide our customers with the finest Cup Shape Brushes. These brushes are of export quality. The approximate Size of brush is 6 (152. 4mm) and can also be customized in exact specifications as demanded by the customers. It has specially developed with twisted or Crimped Steel wire or Brass Wire as per suitable application over surface to remove heavy sludge, rust or contamination. It can be used for preparation of surface for prior to heavy coating just like as drainage pipes.